One Picture Post: So, thanks to my Adult ADD and my God-given ability to think of fifteen different things at any given moment, I thought I would try my hand at writing a blog post based off of just one picture. I’ve aptly named it my “One Picture Post” and it may be showing up more frequently as we enter another busy fall. So, either our daughter is shrinking, or we were in desperate need of clean dishes this morning. Sitting here listening to the gentle hum of the dishwasher is my indication that the later was true. How is it, that dirty dishes seem to be able to multiply so quickly? 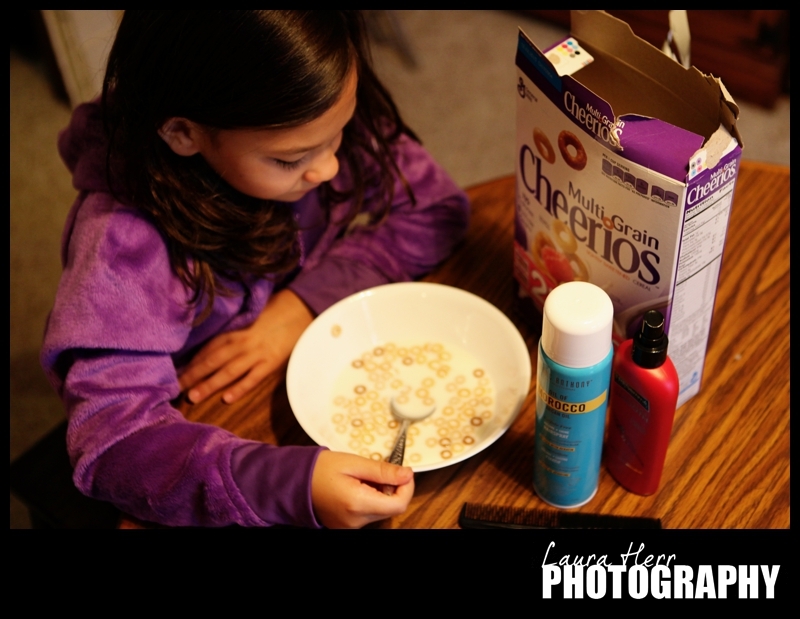 Thankfully, our resourceful girl had no problem eating her breakfast out of a salad bowl. She was all cozied up on this cool Fall morning, in her new purple, furry jacket. “I LOVE this COZY jacket,” she tells me each morning and she does. It was a Costco purchase, bought at the same time as her new pair of purple furry gloves. She keeps trying to sneak them off to school, though I tell her she doesn’t need them and that there is a good chance that they are going to be lost before winter. However, she cleverly clips them into the inside pocket of her jacket and I suppose if it makes her that happy, it’s not such a big deal in the end. The multiple hairsprays in the picture are thanks to the four lettered friend that has shown up in our kids’ schools. We haven’t gotten an official letter, but I read through a huge post on our community page yesterday that shared all about how the schools are going through a lice infestation. Ellee wasn’t thrilled about wearing her hair up but after I kindly explained what might happen if she gets lice and how we are trying to prevent, she complied. I’m hoping that the gallon of hairspray that I sprayed on her hair will repel the nasty little bugs. After pulling her hair up in what I thought was a cute little bun, she ran upstairs to add a sparkly bracelet to finish the look off. She’s such a girly girl. Speaking of sweet girls, we’ve added another one to our extended family and for the first time in a long time, it wasn’t from my side of the family. My sisters have been the ones to keep us busy with birth announcements with the 11 kids that they have between them and while my younger sister Sarah is expecting her 5th in December, it was Jeremy’s sister Kylene who got to share the happy news yesterday. Her and her husband, Matt welcomed a precious little girl into our family. And thanks to the miracle of Skype, we got to meet sweet Jae Ella Pepper Lu, and she is a beauty. Now we have to figure out just how we are going to meet that darling baby in person. And there you have it. Not bad, for a first try at a one picture post. I’m now off, to prepare for our new after school program, hangtime. This afternoon is our first meeting and I’m so excited and nervous and looking forward to meeting up with the amazing leaders and students that will come. Have a wonderful, wonderful day!